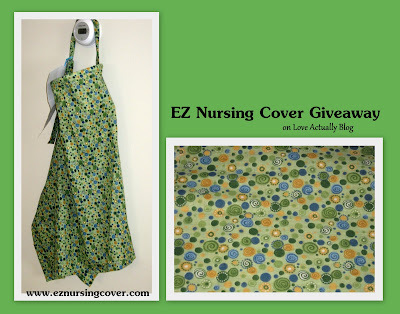 Carli from EZ Nursing Cover is today's "Then Comes Baby" giveaway sponsor! She specializes in creating trendy nursing covers at a great low price...which is wonderful for mothers on a budget! She also sells fabric organizers, baby wraps, and aprons. Check out all her options on her website HERE. These really are so nice to have, and a great gift! I have seen these used by a few moms recently and wondered where they got them! So awesome!! I'm a follower, voted, and checked out the site! I'm expecting in August, and it would be awesome to have a light cover to nurse with! I wanna win!! i'm due in october with our #6. i had a nursing cover, but sold it at a garage sale last fall . . . oops! anyway, i would LOVE to win. I have a 4-week old baby and nursing in public is hard! This would make it so much easier. I'm expecting any day now and could really use one of these covers!!! Followed, Visited, and Checked out the site! (Signed, Sealed, Delivered!) I'm due any day as well and have heard these are amazing! Please oh please! I follow, visited the cute site, and voted for you. This fabric is so cute and these are soooo useful! I follow you blog, checked out the site and voted! Something like this could come in handy with baby #1 in September! I followed and visited. My sister-in-law is due in about 6 weeks and would love one of these!! I followed, visited, and voted. I would love a couple of these things and yes the fabric is adorable! I love having a nursing cover. I use mine all the time and could use another. I hope I win. Oh by the way I follow, I voted, and I checked out her website! Cute cute stuff! oh and i voted! I am a nursing mom. My cover is a little short and could use a buddy to rotate with. :) thanks. I'm due in September--I'd love to win this nursing cover. I agree, very cute materials! Cher, love the "then comes baby" segment you've been doing. Did it all! Thanks for your awesome ideas Cher! I follow and what great timing for this giveaway! I am due with #2 in a few weeks. I never had a cover like this with my first....this would be a life saver and besides, it's super cute!!! What cute fabric for these nursing covers. I have a friend expecting in August. This would be a perfect shower gift. I follow and voted!! Gr8test idea ever! These are so cute! Every mother needs one! yay! i'm your 1900th follower! very lovely blog! This blog is awesome! I'm happy to vote for it! Just did all of the qualifying steps. I'm pregnant with my 2nd child and, boy, would one of these nursing covers have helped me out with the first one! I hear they're great! I'm a follower - but this nursing cover wouldn't be for me. I have a friend expecting her 4th baby and she could use this (and would) more than me (I only nurse for a few weeks tops LOL). I am a follower!!! And I love the Paisly print over at Carli's!!! And I voted for you!! I am a follower, voted for Love Actually on top mommy blogs, and visited her site. I am loving all these mommies who are selling awesome nursing covers. They are way better quality than boutique ones and SO much cheaper. Thanks so much Carli for what you do! I love the print on this cover. I am expecting late this summer and would love this cover. I checked out Carli's website and everything is reasonably priced and I love the EZ wraps. Not pregnant yet but this will be great when I do have a baby! The fabric is so adorable! I've checked out her site and voted and of course i'm a follower! We are having our first baby in October & would love to win. I follow, I voted, & I checked out the great stuff on her site! Follow, voted and checked out her site. Such cute fabrics and great prices! Aww yay so nice! I really need one of these! I already follow love actually! I checked out Carli's website! I love this idea. What a great gift too! So cute!! Love the fabric! This is Carli from EZ Nursing Cover. First I want to thank Cher for letting me do a give away! Next I want to apologize to you all who have checked out my site. Google Creator (the host for my website) picked a bad day to to switch my website to the new Google Pages Host. It completely messed my website up. None of my functions are working and there were white boxes all over the place that shouldn't have been there. I am so embarrassed :( I promise it was in fine shape yesterday. I think I have got it all fixed now, but I wanted to at least apologize! Please check out my site now. It is fixed I promise ;) Thank you for looking! I'm a follower! I LOVE my nursing cover, and would love to have another one to keep in my diaper bag so that I don't forget mine at home! Follower, voted, visited. These are the cutest covers I have seen. oh I want one I didn't have one with my first 2 and for this next one I really want one! Done and done! I'm having my first baby in September and I have nothing for him yet! I have loved your blog since you started it! It has given me so many great ideas!! Many thanks!! I just love your blog and have already used some of your ideas and had great results - glad to see more ideas about parenting too! I really hope I get one of these! They look so convenient. I would love to win one of these to give to my friend that is expecting! They are adorable! I checked out the site! Following since yesterday, and the website is gorgeous (I haven't bought a nursing cover yet - LOVE the pink baby one. ), and I also voted. I love your website and Love the Nursing Covers. I am preganant with my 3rd child and a second nursing cover could really come in handy. Pick me!!! i have some friends and or relatives that are expecting and that would love one. I have became a follower. I think those nursing covers would be super handy! I checked out Carli's site... she has an awesome name!! My name is Karlee too!! Already follow-Check, Carli's site-Check, Vote-Check! I love it! Did all 3. I follow your blog, checked out the site and voted! This would be great! I followed all the rules and REALLY love these nursing covers! I'd love to win!